How much do Capitals suites cost? 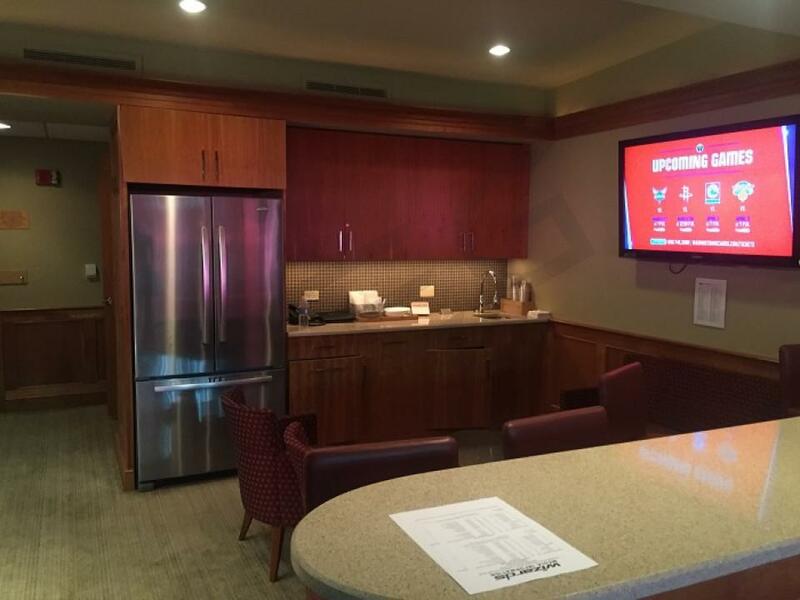 Prices typically range from $3,000-$4,500 for Washington Capitals suites. 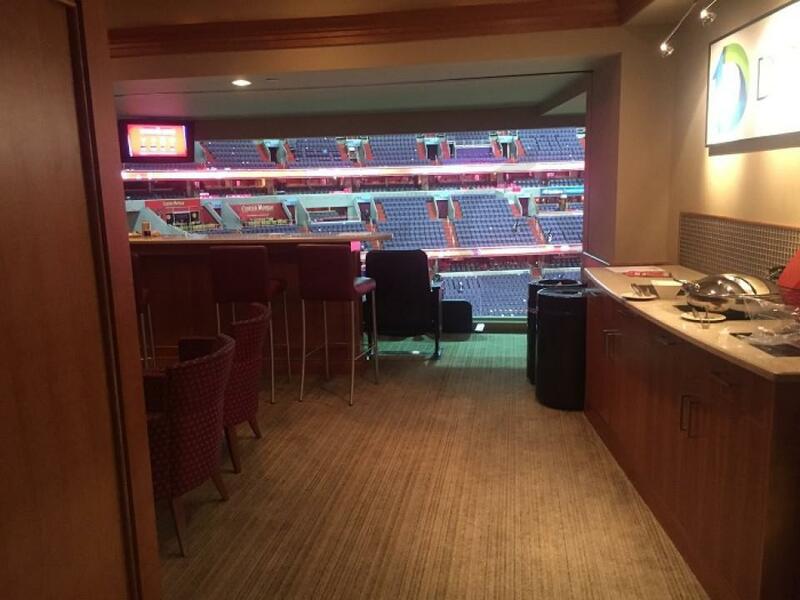 Capitals suite prices will vary based on opponent, day of the week, and suite size/level/location. 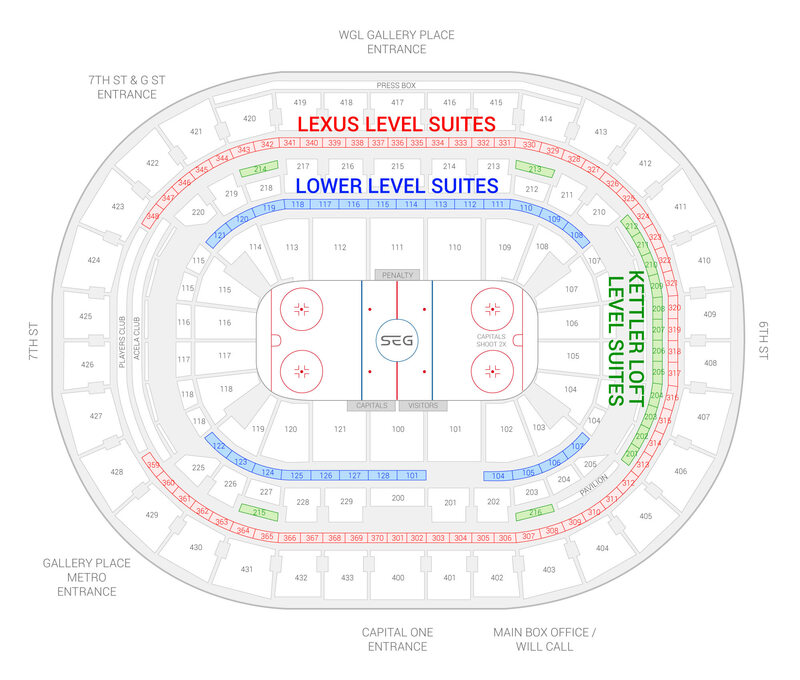 Capital One Arena has three different suite levels; suites located on the Lower Level and Loft Level are generally more expensive that suites on the Lexus Level. Lexus Level Suites are located on the 3rd suite level at Capital One Arena. Lexus Suites come with 18 suite tickets and 2 VIP parking passes. The most common seating configuration in Lexus Suites is 12 fixed stadium-style seats facing the floor and 5-8 bar-stool seats arranged at a high top table. Additional standing room tickets are available to purchase. Suite amenities include a private restroom, two HDTVs, and a full wet bar. Loft Level suites are located on the second suite level at Capital One Arena. Loft suites include 24-28 tickets. Kettler Loft suites feature 18 stadium-style seats facing the floor in addition to 6 barstools arranged at a high top table. Additional standing room tickets are available to purchase. Kettler Loft Suites each have a private restroom. Other suite amenities include HDTV's, a full-sized refrigerator, closet, and wet bar. Suite Experience Group helps customers plan corporate and personal events in luxury suites at Capital One Arena. In this section we’ve compiled considerations when planning your next group event at Capital One Arena. Capital One Arena has three suite levels featuring a variety of suite sizes and configurations. The largest suite level is the Lexus Suite Level. Most suites on the Lexus Level will accommodate groups of 18. Kettler Loft Level Suites (2nd Level) are generally larger in size. Loft Suites will accommodate groups of 24-28. Lower Level Suites are similar in size to Lexus Level suites; these suites will accommodate groups of 12-18. Private luxury box rentals at the Capital One Arena will vary widely in price depending on event. The average price range for NHL and NBA suite rentals is $2,500-$4,500. Prices will vary based on opponent, day of the week, and suite level/size/location. 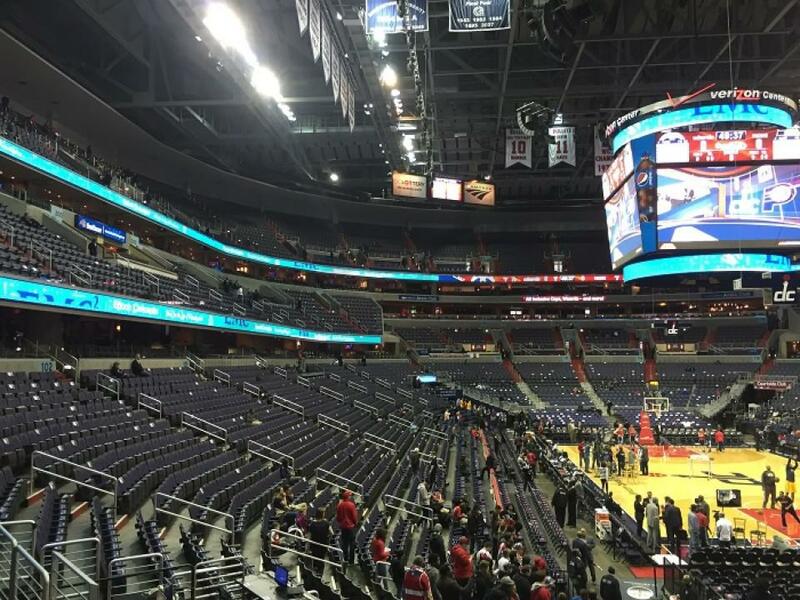 Washington Capitals (NHL) suites are, on average, slightly more expensive than Washington Wizards (NBA) suites. 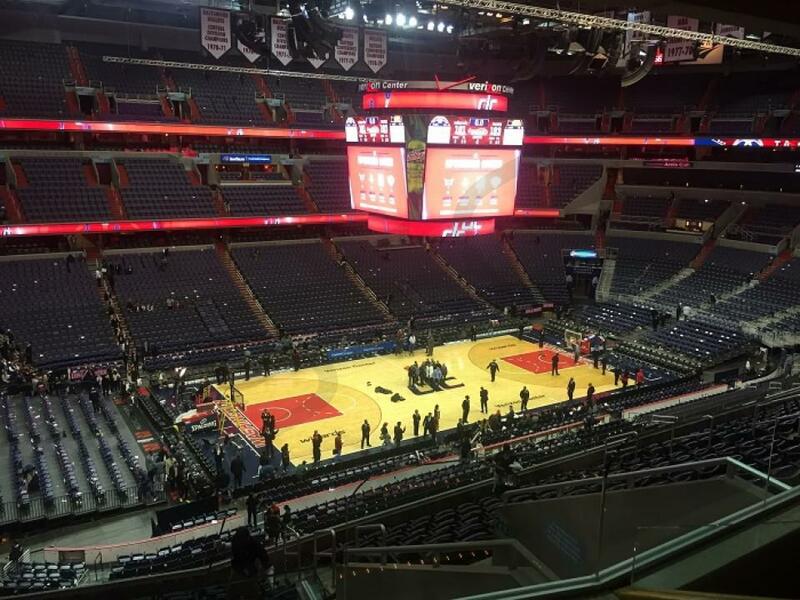 Capital One Arena is also home to Georgetown Hoyas Men's NCAA basketball, Washington Mystics (WNBA) and Washington Valor (AFL). Suite prices for these events are generally cheaper, ranging from $1,000-$2,000. Suite rentals for concerts and other family events can range from $2,000-$10,000. Catering for all Capital One Arena suites is provided by Aramark. Catering is available to preorder in advance of your event. Alternatively, you can order from your suite during the event. The Gameday Catering menu will be slightly more limited than the Advance Preorder Menu. The Capital One Arena suite catering menu offers extensive catering packages and a la carte options for your suite. Suite Experience Group will assist with selecting the appropriate package for your group based on group size and budget. All luxury suite ticketholders will have access to the PwC Club located on the Club Level Concourse. The PwC Club is a high-end restaurant and cash bar. The PwC Club opens 90 minutes prior to sporting events and 1 hour prior to concerts. This is a great spot to rendezvous with your group prior to entering the suite. There is no dress code for luxury suites at Capital One Arena. Corporate groups will usually be dressed in business casual attire; however, it is not uncommon for patrons to wear jeans with a shirt or jersey of their favorite team. Children under the age of 3 will not require a suite ticket. The Gallery Place-Chinatown metro station is located underneath Capital One Arena. The Red, Yellow, and Green lines all stop at this station. Other nearby metro stations include: Judiciary Square (Red), Metro Center (Red, Orange, Silver, Blue), and Archives-Navy Memorial Penn Quarter (Green, Yellow). The metro runs until 11:30 PM Monday-Thursday, 1 AM Friday-Saturday, and 11 PM on Sunday. Luxury boxes at Capital One Arena will come with an allotment of VIP parking passes. VIP parking is located in the Lexus Garage attached to the arena. The executive suites will-call window is located next to the box office at the main F Street Entrance. Window #1 will open 90 minutes prior to the event. Capital One Arena entrances open 90 minutes prior to sporting events and 1 hour prior to concerts. All fans entering Capital One Arena will go through a metal detector screening. Bags larger than 14”x14”x6” will are not permitted. The Washington Capitals are your reigning NHL Stanley Cup Champions. The Caps won their first Stanley Cup in franchise history last season defeating the Vegas Golden Knights in 5 games. The Capitals have long dominated the Metropolitan Division with a high-power offense led by superstar Alex Ovechkin. Ovechkin, along with all-stars TJ Oshie, Evgeny Kuznetzov, and Nicklas Backstrom, were finally able to break Washington's long championship drought. Entering the 2018-19 season, the Capitals are well positioned to defend the Stanley Cup. Brayden Holtby returns in net and John Carlson will once again lead a strong defensive corps. Head Coach Barry Trotz retired after last season, and he will be replaced by Todd Reirden. Overall, the Washington Capitals remain one of the NHL's most exciting teams and 2018-19 should be no different. The Washington Capitals brought home the President's Trophy in 2017, finishing with the best regular season record in the NHL for a second straight year. Led by captain and leading goal scorer, Alexander Ovechkin, the Capitals may have the league's most potent offense entering the 2017-18 season. Ovechkin is a nightly highlight reel surrounded by plenty of offensive playmakers. TJ Oshie is a reliable two-way winger. Ovechkin's batterymates, Evgeny Kuznetzov, Nicklas Backstrom and Marcus Johansson are some of the most physically gifted players in the league. American defenseman John Carlson anchors the blueline and Braden Holtby is one of the league's elite goal keepers. With all major pieces returning in 2017, expect the Capitals, led by coach Barry Trotz, to once again contend for a Stanley Cup. All-in-all, the Capitals are certinaly the one of the NHL's most exciting team to watch. Capital One Arena (formely the Verizon Center) is home to the Capitals and also the Washington Wizards. Capital One Arena offers some great skyboxes to watch the puck drop from. Whether you are entertaining clients or watching the game with friends and family, the Caps are one of the premiere shows in D.C. A Capitals suite offers theater-style seats with premium in-suite catering options and a suite attendant on-site. If you stay in Capital One Arena luxury box you will get VIP parking, private entry into the arena and exclusive access to the arena’s clubs and lounges. Our largest Capitals suite can sit up to 28 guests. The Washington Capitals advanced to the second round of the playoffs in 2014-15 before being eliminated by the New York Rangers. The Capitals finished second in the Metropolitan Division and fourth in the Eastern Conference. The Capitals were one of the best offensive teams in the NHL led by one of the league’s best players in Alexander Ovechkin. Ovechkin finished the season with 53 goals and 81 combined points. Nicklas Backstrom led the Capitals in assists with 60 and had a combined 78 points. Head Coach Barry Trotz was also able to lean on John Carlson and Marcus Johansson. Goalie Braden Holtby finished in the top 5 for GAA last season. The Capitals start the 2015-16 season off with a four game home stand beginning on October 10th. The Capitals are still in search for their first Stanley Cup Championship. The Verizon Center is home to the Capitals and also the Washington Wizards. 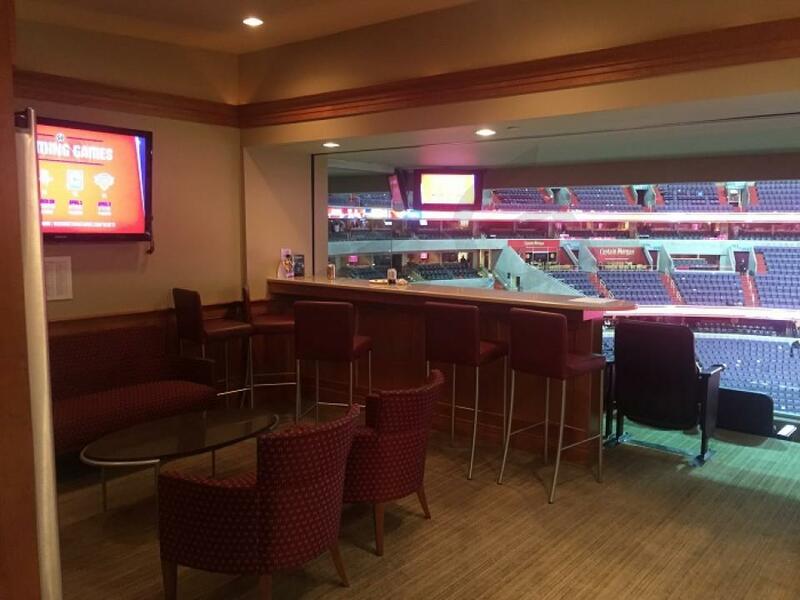 The Verizon Center offers a great place to watch the puck drop whether you are entertaining clients or watching the game with friends and family. A Capitals suite offers theater-style seats with premium in-suite catering options and a suite attendant on-site. If you stay in a Verizon Center luxury box you will get VIP parking, private entry into the arena and exclusive access to the arena’s clubs and lounges. In 2013-14, the Washington Capitals just missed out on the playoffs. This was the team’s first time since 2006-07 that they failed to reach the postseason. To start off the new season the Capitals will face off against the Montreal Canadiens on October 9th at the Verizon Center. To get back in the postseason the Capitals will once again turn to one of the NHL’s top players Alex Ovechkin. Ovechkin scored 21 goals this past season. After making his long awaited NHL debut, Evgeny Kuznetsov looks to be a Capitals star in the making. The Capitals will have a new coaching regime with head coach Barry Totz at the helm in 2014-15. The Verizon Center offers a great place to watch the puck drop whether you are entertaining clients or watching the game with friends and family. A private luxury suite for the Capitals offers theater-style seats with premium in-suite catering options and a suite attendant on-site. 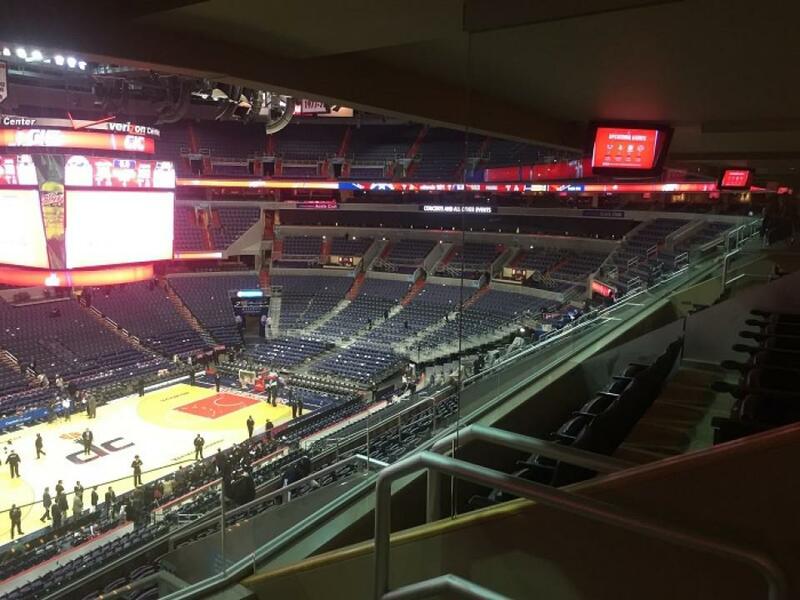 If you stay in a Verizon Center luxury box you will get VIP parking, private entry into the arena and exclusive access to the arena’s clubs and lounges. The Washington Capitals feature one of the NHL best players in Alex Ovechkin. Ovechkin is just one of 8 players in NHL history to win the Hart Memorial Trophy at least 3 times. The Capitals have one of the league’s strongest power play units but have lacked the defense at times to keep them in the game. A strong second-half of the season could sneak the Capitals into the playoffs. A private luxury suite provides fans with a perfect view of the ice. Watch the action from theater-style seats with in-suite catering options and a suite attendant on-site. If you stay in a luxury box you will get VIP parking and private entry into the arena. Thank you for signing up for specials at Capital One Arena. Enter your email address below to stay in touch. We'll sign you up for our newsletter, which will inform you of the latest inventory and events at Capital One Arena. We promise we will never sell or distribute your information. The seating chart below shows where the Washington Capitals suites at Capital One Arena are located.